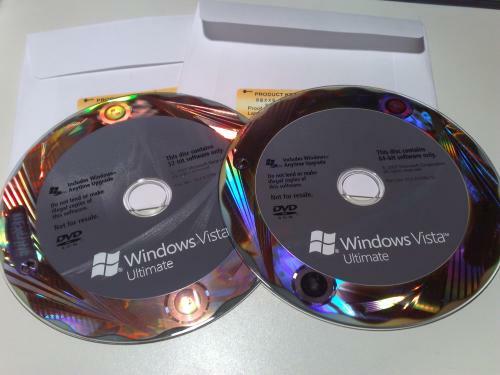 I have two copies of Windows Vista Ultimate for sale, as you can see in the picture below each copy includes a genuine holographic DVD and a (different) yellow COA sticker on the back of the CD sleeve. One is an x86 DVD and the other is x64, but the keys are just Vista Ultimate FPP keys and should work with x86 or x64 editions so you can just download the other edition and use your legit key with it. Both of the keys are totally unused and unactivated and it all came direct from Microsoft so is fully genuine. Any offers? All offers will be considered, but serious ones only please! Can send you the DVD and sticker, or just email the key to you if you want to save on postage costs. As a guide, Vista Ultimate is currently selling for £177 for the full retail boxed edition and £140 for the OEM, obviously I don't expect quite as much as that but that is how much Vista Ultimate normally costs! Not that I have an interest in this (I can get Vista Ultimate for 65 USD), but it might help you sell your copies if you list whether these are retail or OEM keys. If you mentioned it, then I'm sorry, and I guess I missed it. FPP = Full Packaged Product. These ones were from the Centro beta and are full retail keys (it says "FPP" on the sticker). I'd rather only sell these as a complete set as the keys will be harder to sell on their own and I don't need them myself as I have 5 Vista keys now and only 2 PCs that can run it! Any offers guys, come on you know you want a cheap but genuine copy of Vista Ultimate! Of course... Everyone is supposed to know what FPP means. Silly me. 83.5972339 British pounds? 129.35 US$? 100€? For one copy (if so which one) or both? I'll give you $30 USD + shipping. I would sell you the x86 DVD and key for £80 if you want - I estimate postage/packing at £2 standard or £5.50 signed-for (you are in Austria?). Let me know if you want it and if so when you'll be able to pay for it (I would send it as soon as possible after receiving payment by PayPal). Hmm gimme a min... 95€ =/ a bit much, can I tell you tomorrow or in 2 days? Yep sure It's still less than half what a retail version would cost you though so I'd say it's not a bad deal! I've sold the x64 disc and key to someone elsewhere but still have the x86 disc and key (key can be used with an x64 or x86 copy), does anyone here want it? serious now, are the bids for the key or the disk or both? Both, I had two discs and two keys and now have one disc and key left (though the key is the main thing of value, the disc is just what you can download from pretty much anywhere, so if you don't want it then you obviously don't have to pay shipping costs) - the offers so far are a bit low compared to what a full non-OEM licence for Vista Ultimate is worth though, serious offers only please! I am considering it. I will need to check if vista basic works on a machine before I put down an offer. x86 Ultimate is left, although all Vista keys work with both, it is only the disc that is x86-specific - Vista needs a PIII processor (800 specified but as far as I know it doesn't stop you installing on a slower PIII; it won't work on a PII or lower) and 512 MB Ram (but I think it installs with 384 MB without complaint and will run but not install (without hacks at least) on 256). $30 USD for the x86. How much would be shipping cost to the Philippines?